Global Network, Local Control. Large Scale, Small Expense. The Zyxel Cloud CNM SecuManager enables quick configuration of a single device or a group of devices to improve management efficiency and to reduce overhead for massive deployments. It allows administrators to conduct firmware upgrade for multiple devices and to minimize end-user service disruption with the scheduling option. The device settings can be saved and restored on a regular basis or on demand, while the group operation design relieves network maintenance efforts for administrators. IT staff often find themselves bogged down, wasting time on setting up the same configurations for multiple devices over and over again. Zyxel Cloud CNM SecuManager streamlines and simplifies such operations so that tasks can be easily added to predefined device groups. All scheduled tasks can then be executed automatically or manually in groups. 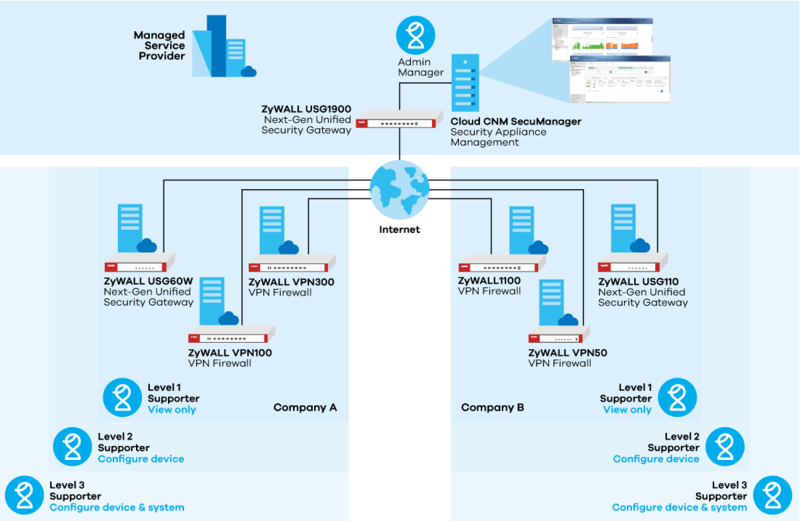 The Zyxel Cloud CNM SecuManager provides quick and easy service activation of VPN provisioning to accelerate consistent, reliable multi-sites deployments. It also reduces time and complexity to enable cost-effective supports for varying requirements across the network as there are four types of VPN provisioning: site-to-site, full mesh, hub and spoke, and remote access. When IT staff needs to check on a deployment, the VPN connection status for either a single device or a community can be easily monitored. This makes it easy for administrators to track tunnel status to stay on top of overall network conditions and make quick comparisons for debugging. The intelligent management of Zyxel Cloud CNM SecuManager accelerates speed of service deployments for improved operating efficiency. When registering a device to the server, IT staff usually needs to manually input the exact country, city or even real address to determine the device location. If above information is unavailable, the location cannot be mapped. Zyxel Cloud CNM SecuManager solves this dilemma by providing a precision GeoIP service that automatically locates the device using its extensive GeoIP database. Level 1 supporter: Access to support portal; read-only. * Note : License owner could use the same account to login MZC. 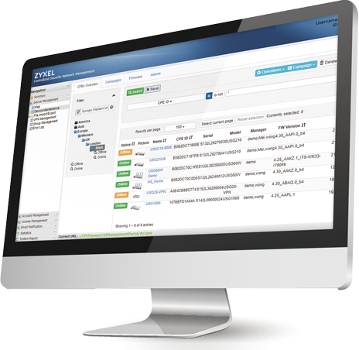 Download the Zyxel SecuManager Datasheet (PDF).